Peter Parker is alive and well on the set of Spider-Man: Far from Home. Tom Holland was spotted shooting scenes from the joint Sony and Marvel adventure, which comes on the heels of Avengers: Infinity War. We all know what Thanos' snap did to Spider-Man, but it looks like the boy will be back to live another day. Though many at Marvel insist that the end of Infinity War is permanent, there's no way that can be true, with Spider-Man: Far From Home and Guardians of the Galaxy Vol. 3 both coming in the wake of Avengers 4. We'll learn what really became of our heroes in that finale, but for now, we'll have to guess. These images don't tell us much. Spider-Man: Far From Home has just begun filming, even though Avengers 4 still has another 11 months to go before it's unleashed on the populace. As the title suggests, Spider-Man: Far From Home will be taking Peter Parker out of New York and around the world for the trip of a lifetime. Jon Watts has returned to shoot this sequel. These first set photos were snapped at Bishop's Stortford, England, and they offer a first look at Parker after he was turned to dust. The images were taken by Sophie Playle, who randomly stumbled upon the production while going about her daily routine. She says this about the images. "Casually starting off the week by watching Tom Holland walk onto set where they're filming the new Spider-Man movie, just around the corner from where I live." Not much can be gleaned from the photos. We see Holland chatting with some unidentified individuals while sipping coffee, there's a film advisory that assures shooting has begun, and we get to see the main exterior of the shooting location. Why is Peter in England? That plot point has yet to be revealed, and probably won't be for quite some time. 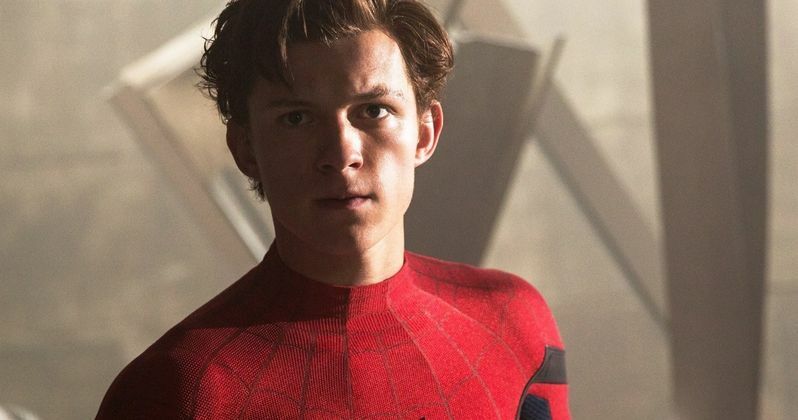 It's noted that Tom Holland is shooting inside an abandoned building. Shooting this scene on location as opposed to a soundstage suggests the building in question holds some importance to the story. No plot details have been leaked just yet, though we know Mysterio is one of the villains, who may or may not be played by Jake Gyllenhaal. And Micheal Keaton is returning as The Vulture. Peter Parker is on vacation in Spider-Man: Far From Home. He's not on a school trip according to Marvel big boss Kevin Feige. You can take a look at the first Spider-Man: Far From Home set images below. The sequel will be the first Marvel movie to take place directly after Avengers 4, and arrives July 5, 2019. The story will take place just moments after the events in Avengers 4, so there will be a lot of connectivity to the two movies. Check out the images from Sophia Playle.